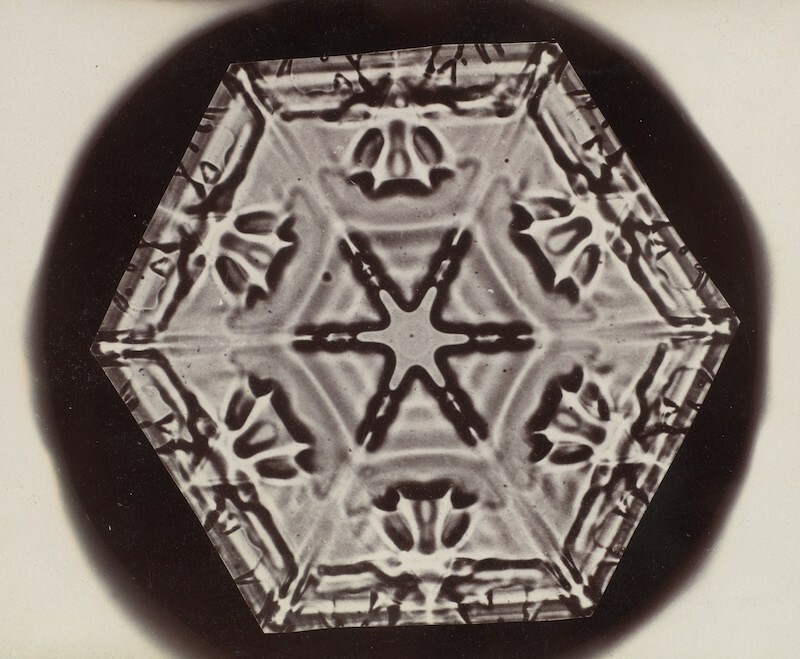 Keith C. Heidorn takes a look at the life and work of Wilson Bentley, a self-educated farmer from a small American town who, by combining a bellows camera with a microscope, managed to photograph the dizzyingly intricate and diverse structures of the snow crystal. 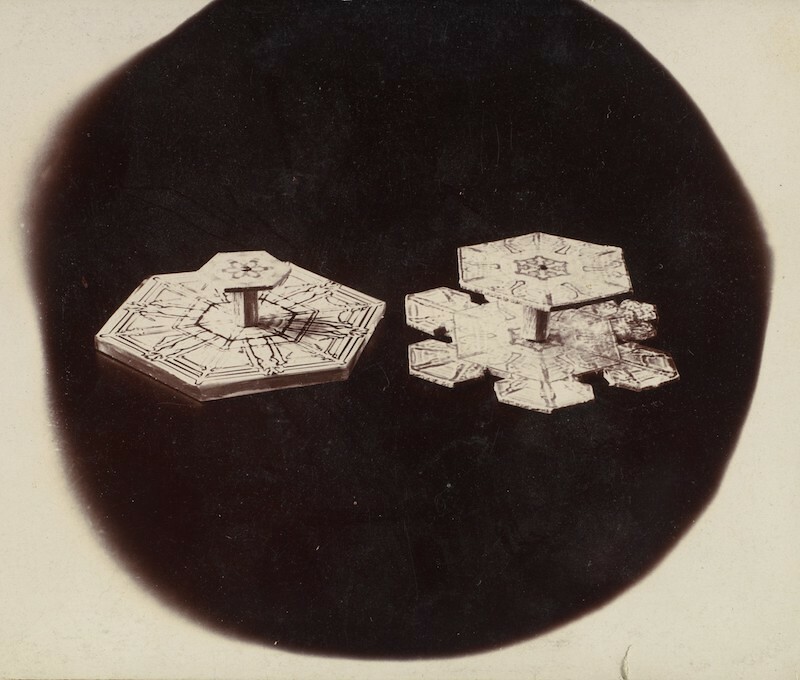 In addition to the development of the hardware, Bentley also had to devise a protocol to capture a snow crystal and transport it with minimal damage to the camera’s field of vision. What he found worked best was to capture the crystals on a cool velvet-covered tray. Taking care not to melt the crystal with his breathe, he identified a suitable subject and lifted it onto a pre-cooled slide with a thin wood splint from his mother’s broom and nudged it into place with a turkey feather. The slide was then carried into his photographic shed and placed under the microscope. The back-lit image was focused using a system of strings and pulleys he devised to accommodate his mittened hands. 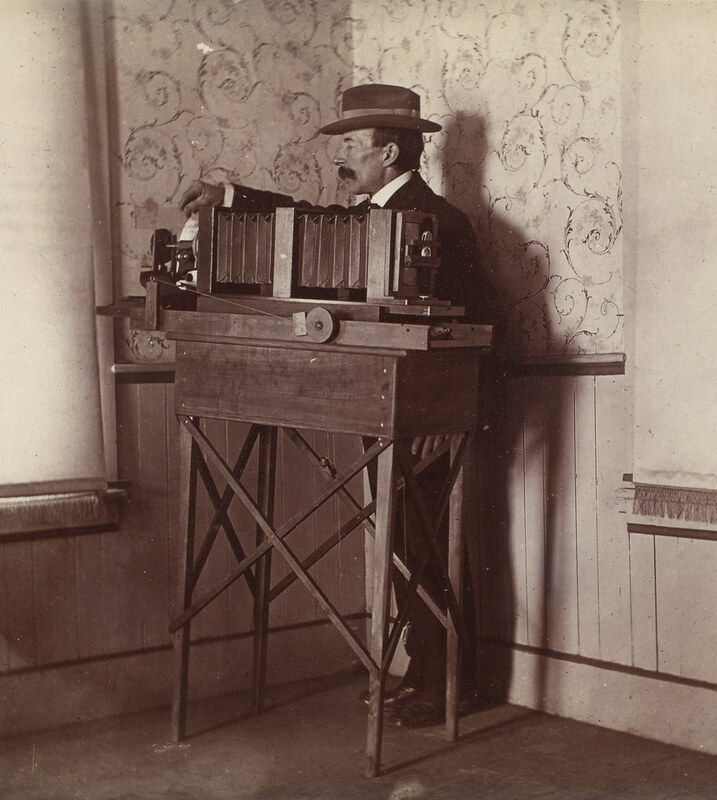 Once focused, the sensitized glass plate — the “film” — was exposed and stored for further processing, development and printing. Unfortunately, Bentley was so far ahead of his time that he wasn’t fully appreciated by contemporary scientists. They didn’t take this self-educated farmer seriously. It was forty years later — the study of cloud physics and precipitation processes would not blossom until the 1940s — before his raindrop work was rediscovered and corroborated. The first recognition of Bentley’s raindrop experiments appears to have been by US Soil Conservation Service scientists J. O. Laws and D. A. Parsons, who published a paper in 1943 reporting measurements of raindrop size under various rainfall intensities using Bentley’s collection method. 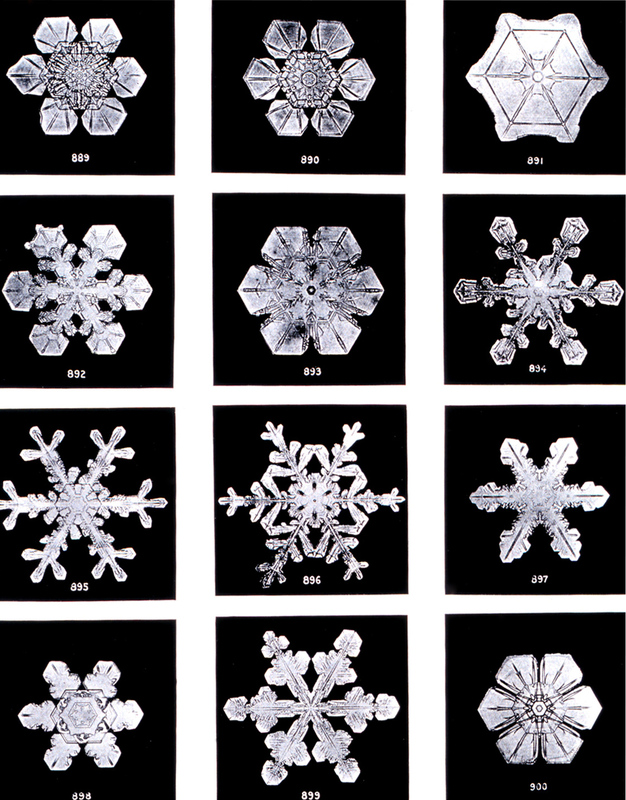 Although he dropped his study of raindrops after a few years, he continued to photograph snow crystal and speculate on the nature of snow. 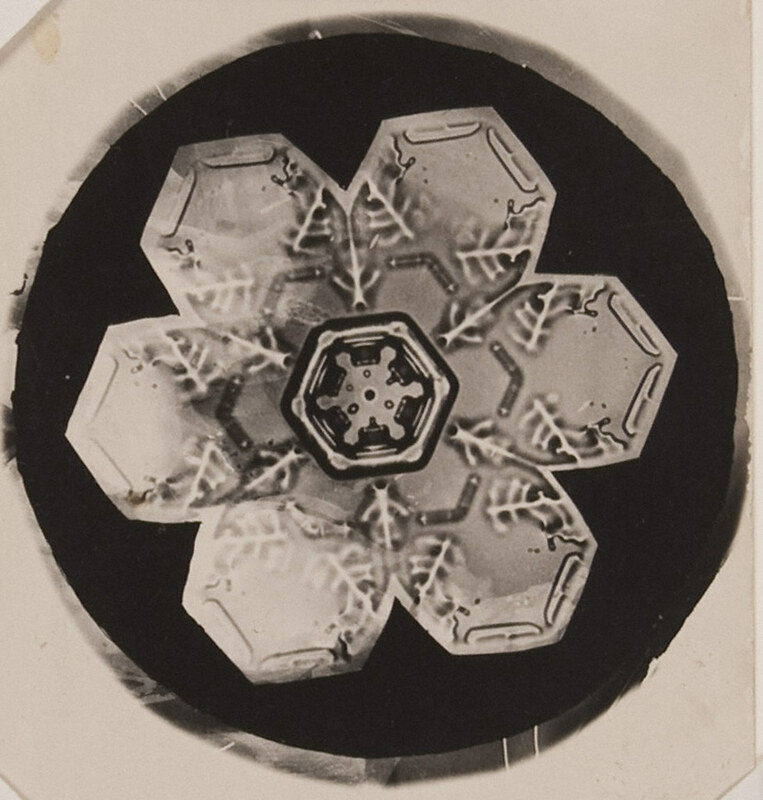 From his large data archive, Bentley’s analysis convinced him that the form the ice crystal took (hexagonal plate, six-sided star, hexagonal column, needle, etc.) 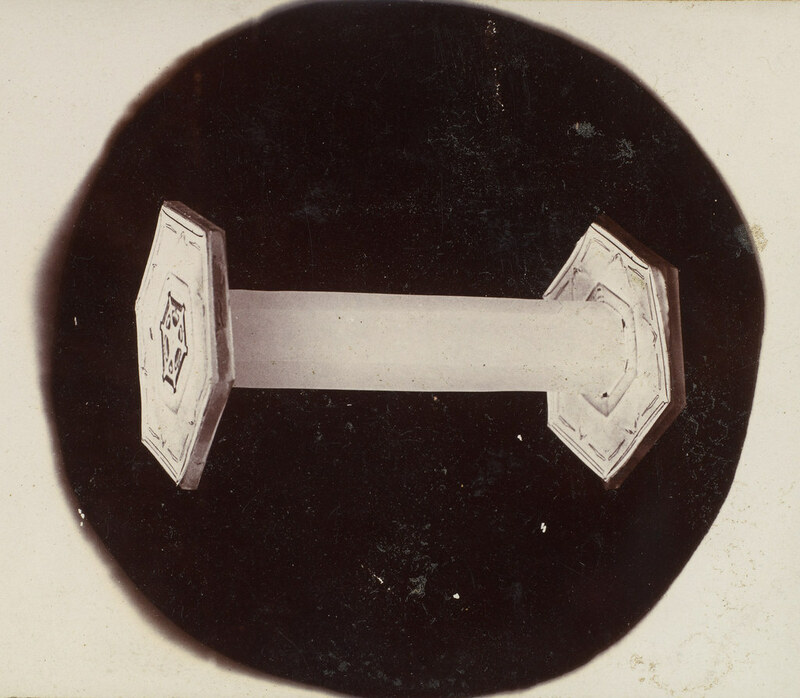 was dependent on the air temperature in which the crystal formed and fell. Nearly three decades would pass before Ukichiro Nakaya in Japan would confirm this hypothesis. He also wanted to promote his work for its beauty, and thus submitted articles and delivered lectures that focused on his snow photography over the years. His lectures were popular, and from them he was dubbed The Snowflake Man and Snowflake Bentley by the newspapers. Over one hundred articles were published in well-known newspapers and magazines such as The Christian Herald, Popular Mechanics, National Geographic, the New York Times Magazine, and the American Annual of Photography. His best photographs were in demand from jewellers, engravers and textile makers who saw the beauty in his work. Longfellow said that genius is infinite painstaking. John Ruskin declared that genius is only a superior power of seeing. Wilson Bentley was a living example of this type of genius. He saw something in the snowflakes which other men failed to see, not because they could not see, but because they had not the patience and the understanding to look. Keith C. Heidorn, PhD has nearly forty years of experience in meteorology, climatology, air quality assessment, and education. Currently, enjoying semi-retirement in the Canadian Rockies, he continues to write The Weather Doctor internet site. The site, now beginning its fourteenth year, celebrates the beauty of weather through science and art. Dr Heidorn is author of three books: The BC Weather Book: From the Sunshine Coast to Storm Mountain, published in 2004, and And Now…The Weather, released in July 2005, and The Field Guide to Natural Phenomena, coauthored with Ian Whitelaw, released in 2010. When not writing about the weather, Keith can be found painting weather and other landscapes using oil, acrylics and watercolors. 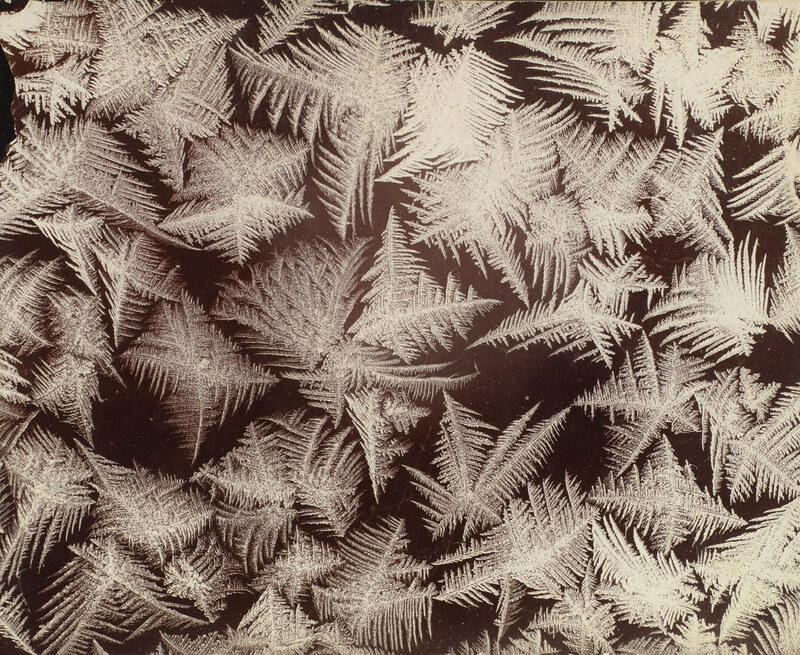 This first biography proper of Wilson Alwyn Bentley, the farmer from Jericho, Vermont, who took over five thousand photomicrographs of ice, dew, frost, and — especially — snow crystals. 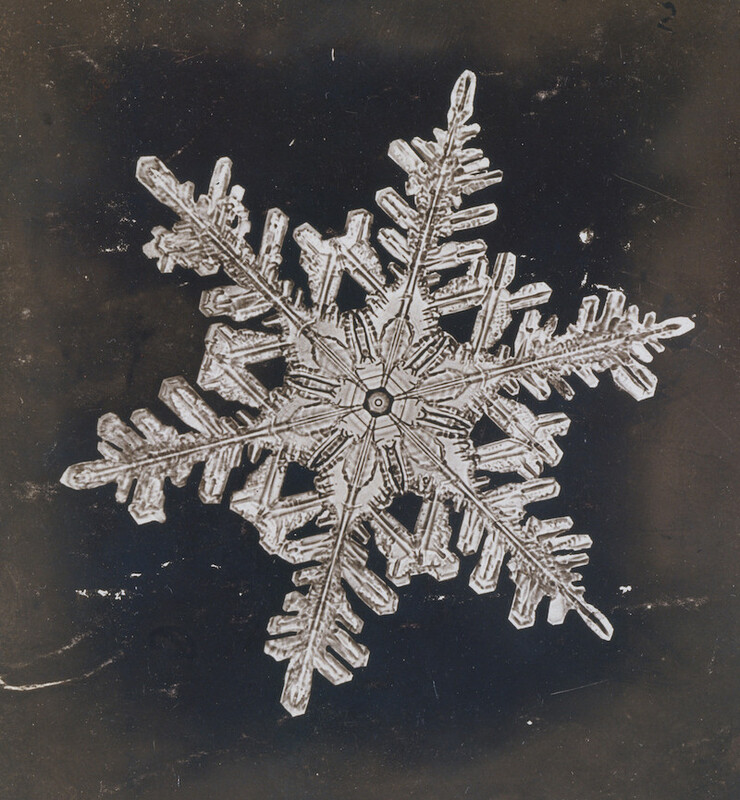 ‘The Snowflake Man’ lays open the life of a simple, self-educated, sensitive man who pursued natural beauty with microscope and camera for nearly fifty years. The book contains 30 black and white photographs. In 1931, the American Meteorological Society gathered the best of Bentley’s photos and had them published; that work has long been available in a Dover reprint edition. The present volume includes a selection of 72 of the best plates (containing over 850 royalty-free, black-and-white photographs), carefully selected from that larger collection. An inexhaustible source of design inspiration for artists, designers, and craftspeople, these graceful patterns are ideal for use in textile and wallpaper design, as well as a host of other creative projects. These images will also appeal to anyone intrigued by the intricacy and beauty of design in the natural world.